We don’t eat out often, but when we do I really like to go to Johnny Carino’s. The last time we were in there, my husband and I shared an order of Penne Gorgonzola and I got the bright idea that I could cook up a knock-off version at home. I was right! This tastes almost exactly like the restaurant version. I was so focused on trying to re-create this dish that I forgot about taking a picture of the chicken. Unfortunately, it was pouring the rain so I had to grill it on the George Foreman. The outside grill would have made it taste better, but it was still fine. I just sprinkled it with salt and pepper before grilling. Heat the water for the pasta and cook it according to the package directions. While that’s cooking, melt the butter in a saucepan. Saute the garlic for a bit in the butter. 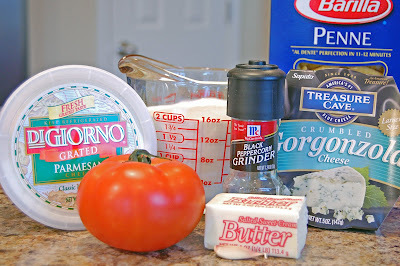 Whisk in the half & half and heat it over medium heat, then whisk in the cheeses. Allow the cheese to melt and add the pepper. I tried to keep mine hot, but not boiling but I wasn’t successful. It boiled just before I was about to pour it on the pasta. 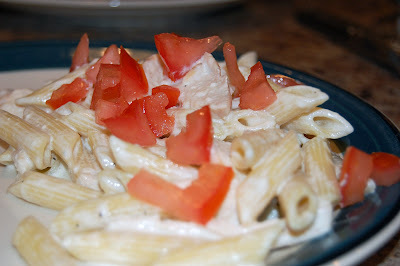 At first the sauce seemed very thin, but then after adding it to the pasta it thickened up. 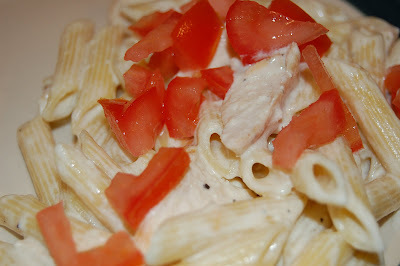 Pour the sauce over the pasta and stir in the thinly sliced grilled chicken. The Carino’s version also has mushrooms, so if you like those you could add them in. Top with chopped tomato and extra cheese if you like. This was a hit with everyone in the family. Now I need to conquer my other favorite dish from Carino’s, Bowtie Festival. That’s funny, Sherri! I accidentally hit the enter button and published the thing! I’ve got the whole recipe up now. Can I pretty please with sugar on top and a cherry come over to your house for dinner?? This looks great. I have never had Gorgonzola cheese before though. Is it kid friendly? Gorgonzola is kind of like blue cheese, but MUCH milder. My kids like it and I don’t think they’d go for blue cheese. I’ve never had Gorgonzola cheese either, not to my knowledge or memory. It looks good though! Gorgonzola.. virgins.. sorry if that sounds sort of naughty.. YOU MUST TRY IT. It’s like a mild blue cheese and so flavorful! I’m gonna try this one soon! You had me at gorgonzola. This is going on the menu for the next time I have to actually cook, since the hubby is out of town again. YUM! I just have to say I made my dh stop at the store on the way home so I could make this last night. Fantastic! Thanks for the recipe! There is a similar dish at Chili’s that I love and have made at home! I love being able to do that. Great job on your remake! Carino’s is one of my favorites too! Thanks for posting the recipe can’t wait to try it! THIS IS TOTALLY WHAT WE ARE HAVING FOR DINNER TONIGHT! I found you over at The Thrifty Trendsetter’s blog (Love her! ), and I have now added you to blogs I follow! YOU’RE GREAT! Thanks for the recipe – ALL the recipes for that matter! Erik, my fiance, couldn’t get enough of this recipe and now he thinks I am a GODDESS! Thanks again, Tiffany, for the recipe! This looks so yummy!! It’s on the menu for next week..can’t wait to make it!! We had this for dinner this evening and it was incredible. My younger son,who can be a picky eater at times, loved this. Tried this out tonight. My husband and I loved it, but my kids (3 & 6) were not huge fans. Maybe when they are a little older and they develop more sophisticated tastes. I was thinking that the sauce would be amazing as the base for chicken wing pizza. Amazing. If you want the sauce to be thicker, keep it at a constant boil for about 50 minutes to reduce. Just made this tonight, it was on the list for last week, but got bumped to tonight. I am almost too full to type, but this is now in my top five of all time. And honestly I rarely make the same thing twice, and love to cook. This is my heaven. I just copied four more recipes that I cannot wait to try too! NUM!!!!! LOVED IT! BTW – I only had a half of Gorgonzola and a half of blue so I mixed.